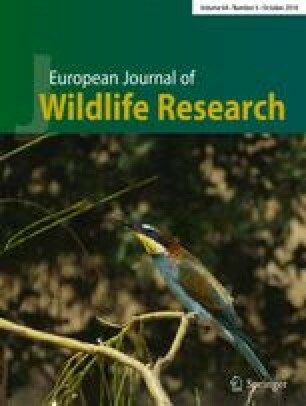 This paper is the first dealing with animal-vehicle collisions (AVC) with red and roe deer in South Tyrol, Northern Italy. The Autonomous Province of Bolzano (South Tyrol) has been collecting AVC data since 2012 on the entire provincial road network. Each year, AVC data accounted for more than 700 cases per year, with several socioeconomic and ecological implications. The aim of this research is to identify the locations where AVC occur more frequently than expected (hotspots) and better outline subsequent implementation of mitigation measures. For an effective identification of AVC hotspots, we applied a combined methodology of temporal and spatial analysis on AVC data collected on the South Tyrol road network in the years 2012–2014. AVC data enabled the identification of the temporal patterns, which showed different behaviors of the two target species in close proximity of the road network and throughout the 12 months. The KDE+ software applied to the 2012–2014 AVC database allowed for spatial analysis and the identification of hotspots, i.e., the road sections having the highest risk for drivers. The integration of the results, coming from the abovementioned methodologies, contributes to a detailed assessment of roads that would allow the identification of the local contributing factors and a base-line of potential problematic areas that will highlight the need for further investigation to assess whether the risk-rank is accurate and allocate effectively limited resources to a feasible number of identified hotspots and reduce the current degree of AVC in the South Tyrolean road network. The online version of this article ( https://doi.org/10.1007/s10344-018-1214-x) contains supplementary material, which is available to authorized users. Michal Bíl, Jiří Sedoník, and Richard Andrášik were supported by project of Transport R&D Centre (LO1610) and the research infrastructure acquired from CZ.1.05/2.1.00/03.0064. The authors thank Lena Schober of the Hunting Office Administration of the Bolzano Province, Philip Sicher of the Road Office Administration of the Bolzano Province, Lothar Gerstgrasser of the South Tyrol Hunting Association for providing the data, Paulina Malys and Julia Stauder of Eurac Research for cooperating in analyzing data and preparing the maps and figures.